Looking for some Dropbox-powered text-editing action but not quite ready to shell out for an app like Second Gear’s Elements? PlainText from Hog Bay Software is an ad-supported, slimmed down alternative that sports the same sync features in a simple, spartan interface. 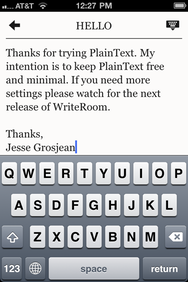 While PlainText is a free download from the App Store, it relies on ads served from Apple’s iAd program. A $5 in-app purchase option to remove the ads is currently awaiting approval from Apple and should be available soon. The app runs on any iPhone, iPod touch, or iPad running iOS 3.0 or later.